Maris Cawthorne, Rhona Gowans and Iona Kellet, just back from a home nations tour. A trio of Borders girls are back home after representing Scotland Under-16s in a series of home nation hockey internationals. Over three weekends away from home, they faced Wales in Wrexham, England at Lilleshall and Ireland at the University of Ulster in Belfast. The Fjordhus Reivers players – Rhona Gowans of Galashiels Academy, and Iona Kellet and Maris Cawthorn of Selkirk High – featured in all eight matches and played a vital role in the team. While Rhona and Maris were thwarting countless attacks against the Scots’ defence, Iona was menacing opponents’ rearguards. The series brought mixed results, but it was certainly a positive experience. After months of training, these matches came fast and hard. The first two against Wales saw Scotland win 2-1 and 5-0, with Kellet just centimetres from scoring on her debut. The next series against England was the main trip of the season as a result of the notorious fierce rivalry. The girls were unfortunate to come away with three defeats. 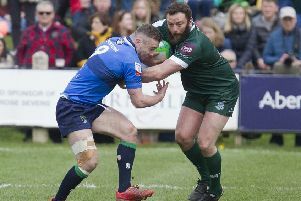 The Scots, facing their toughest team yet, were able to compete on every level and in one of the games narrowly missed out on glory with a 5-4 reverse. The other two games were both tight 3-1 losses. The final series, against the Irish, resulted in two losses and a draw, but the girls were not too disappointed as they proved to be a stronger side than the results would suggest. The Scots’ chemistry and strong bond off the pitch helped them to play together and show what they had learned over the season through their hard work and dedication. The three Borders girls loved every minute of their Scotland Under-16s experience. Rhona said: “This year has been amazing. She went on: “Every time I put on my Scotland shirt I feel incredibly proud to be part of it all. All three Borderers are grateful to the Borders Athlete Support Programme for its backing. Also, they would like to thank their personal sponsors – Locharron of Scotland for Maris and Iona, and Ceta Precision Engineering for Rhona. Rhona also appreciates the continued support she has had throughout the past few years from the Rowan Boland Trust and Club Sport Ettrick and Lauderdale.